Below is an outline of the FIFA 19 competitive eSports ecosystem, known as the EA SPORTS FIFA 19 Global Series, from the release of the game on PS4 and Xbox One all the way through to the 2019 FIFA eWorld Cup Grand Final. This page will be updated regularly as firm dates and locations are confirmed and we will also be listing the winners of each event as they take place. Register on FUTChampions.com by Oct 31, 2018. Play in Weekend League and achieve at least 27 Wins to become FUT Champions Verified. FUT Champions Verified competitors may be invited to and play in Online qualification competitions, competing head-to-head against other top eligible players to earn a spot at a live event. Earn EA SPORTS FIFA 19 Global Series Points through live events and the Weekend League to get placed on the leaderboard. Qualify for the Playoffs by finishing in the Top 60 on the points leaderboard at the end of the year. WHAT IS DIFFERENT TO LAST YEAR? EA have altered the qualification process this year so that year-long consistency is now rewarded, as opposed to an exceptional one-off performance. An example of this is the exclusion of the Last Chance Qualifier - which accounted for a sizable number of participants in last year's Global Series Playoffs - from the FIFA 19 eSports calendar. Instead, strong performances in offline tournaments throughout the year could earn players enough Global Series Points to make the playoffs. Click here to see the latest Global Series Points rankings. Additionally, the Weekend League will no longer earn competitors direct qualification into offline events, but will offer Global Series Points which could be crucial come the playoffs. WHAT ARE THE QUALIFICATION ROUTES? 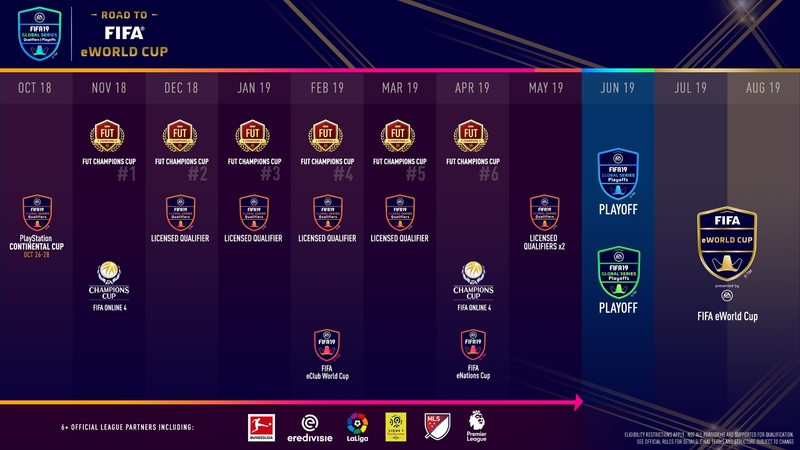 There will be a total of six offline FUT Champions Cups this year (compared to two during the FIFA 18 cycle), with one taking place each month from November until April. Players must first qualify online to participate, and each event will feature a minimum of 32 players per platform. The FIFA eClub World Cup - which sees eSports teams competing against each other - returns this year and has now been classified as a 'Major', which is also the case for the inaugural FIFA eNations Cup. Details on this new addition to the calendar will be released in due course. Seven Licensed Qualifying events will take place throughout the year. These will be on a smaller scale and will vary in size between 16 and 32 players per platform, but will offer the opportunity for eligible players around the world to compete via online qualifiers. Further details on these events will be released in due course. Once again, there will be FIFA eSports versions of football leagues around the world taking place, with Global Series Points on offer in each. The leagues that have so far been officially announced as forming part of the Global Series ecosystem are as follows: Virtuelle Bundesliga, eDivisie, eSuperliga, eLiga, Virtual La Liga esports, eLigue 1, eMLS, ePremier League, E-League, eAllsvenskan, Ekstraklasa and the eJ.League. Sony will be hosting a succession of PS4-only tournaments at various locations around the world, which may have country or region restrictions attached to them. Although these no longer offer direct qualification to offline tournaments, eligible players can earn Global Series Points by competing in every FUT Champions Weekend League between November and April. The FIFA 19 Global Series Playoffs will be the final opportunity for eligible players to collect Global Series Points for qualification to the FIFA eWorld Cup 2019. The participants will consist of the top 64 players on each console (the top 60 from each Global Series Points leaderboard, and the top four players from each FIFA Online leaderboard). WHEN DO THE TOURNAMENTS TAKE PLACE? Most FIFA 19 tournaments do not yet have exact dates and locations but we will update the section below as soon as details are released. To find out when the online qualification dates are for each tournament, click here.